Will you write more stories set in this world that doesn't involve the main character? Once you switch from book one to book two you can definitely tell that I take a greater interest in telling Emma's side, but I also want to make sure that I keep the main focus on Tabitha as it is still her story. I have thought of several different ideas where I could branch out and do a separate book on specific characters- and I very well may- but my current priority is finishing the THS. I think one of the biggest things I love about the THS is that I have somehow managed to reveal everything as the character is figuring it out so that we learn everything as the character is. (I think part of that is because, for the longest time, I had no idea where I was going with it; rather, I just sat down and wrote so whatever the character was experiencing I was experiencing too.) I didn't want to put all the info on the table at once and overwhelm my reader, but I didn't want to leave out so much that I didn't grip them either. Somehow I think I've found the perfect balance and I really have to just thank my dad for listening to my lengthy ramblings and understanding what I mean through all the crazy thrown in. I also have to thank my agent for taking a chance on me and believing in the book and Tabitha's story enough to pick it up and promote it. I have some pretty great people in my life that really helped stitch all of this together. If you have a question about the Tabitha Hale Saga, please feel free to shoot me a message here or leave a comment at the bottom of this post and I will incorporate it into my schedule. (Once you're on the website, click 'contact' on the upper right hand side.) Make sure you subscribe either via email or blog so you don't miss the next question! What influenced the world you have created? My first thought when I read this question was David Eddings. (I swear, everything goes back to that brilliant man!) I was so in awe of the world he created for his characters that it made me want to create my own as well. Imagination is such a wonderful and amazing tool. One can literally use this tool to accomplish anything. Look across time at all the things people have dreamed up- Lord of the Rings, Star Wars, and Harry Potter being the firsts to come to mind. In the creation of those stories, the authors literally reached an entire generation. The power that a properly told story has and its long-reaching affect astounds me, but is also a little scary because, when you think about it, that is a lot of power to wield. Speaking for myself, I really try to be careful what I write and how it comes across to my readers. Even if you aren't an author, I would really encourage you to be mindful of how you want others to remember you and think of the impressions you could end up leaving upon the earth after you are gone. You never know- you could be the one that affects an entire generation. If you have a question about the Tabitha Hale Saga, please feel free to shoot me a message here or leave a comment at the bottom of this post and I will incorporate it into my daily schedule. (Once you're on the website, click 'contact' on the upper right hand side.) Make sure you subscribe either via email or blog so you don't miss the next question! A gymnast! I don't even remember how many years I was in gymnastics and dance classes, but I loved every moment of it. Eventually, it got to the point where I had advanced as high as I could go without putting some serious money into it. That was ultimately when I switched from gymnastics to swimming. All that being said, I have an addiction to the Olympics right now! I'm pretty sure I came out of the womb knowing how to swim and still feel as if I am part mermaid whenever I enter the water. I was a lifeguard for eight years and that was probably one of the best things I have ever done. I frequently wish I could go back to it and may look into being an aquatics director some day, but I will always be a writer first and foremost. I have written three books so far which make up the Tabitha Hale Saga. The first, A Perception of Dreams, is finished and in the publisher's hands. The second installment is currently in the process of being edited and the third needs some more work put into it before I have it edited. I am writing the fourth at the moment and already have an idea of where I want to go with the fifth. There is another series that I have started, but I have been too focused on finishing the THS to write it. I greatly look forward to having the Tabitha Hale Saga finished and put to bed so that I can put my heart into the next big idea I'm working on. As for my favorite, that's like asking me to choose between my children. I love all of them! What is your favorite [healthy] recipe or food? In the past month, I have been making my way towards clearing out all of the processed foods we buy. My goal is to have my family and I eating much healthier than we have been. This includes eating out, drinking soda, and snacking just to snack. I see you are a book collector. Where do you purchase them from? Let me preface this with a quick story behind the question. Each time I visit my parents, who live a couple states away, I bring home a ton of reading material. When I was on holiday last week, I ended up finding many good deals on books which were priced from .25 cents a piece to $1 and tweeted a picture of them all. As always, I came back with at least 30 paperbacks and hardbacks. I suppose it's better than my last trip a few months ago when I came home with 150 children's books for $15. In answer to the question, there is a little handy shop similar to Goodwill where my parents live in Missouri. The prices are to die for. They have dollar bag Wednesdays for all clothing and all children's books (most are brand new) are ten for a dollar. You just can't beat that!!! Let's put it this way. My son will have books to read for the rest of his life at the rate I'm going. How complicated is it to write a book? I mean, can't you just pull out a piece of paper and go? I laughed out loud when I read this! I wish it were that easy. When I first began writing A Perception of Dreams, that's the exact mindset I had adapted. Granted, I wasn't going into it thinking that it could be published one day. I was writing purely just to free my mind of all the clutter. Now that I am in the process of writing book four, book two is being edited, and APOD is in the publishing process, I now realize how complicated it all is. Ha. Alright, you asked for it. I roll out of bed at eight- literally, I hate mornings- and pull my 'mommy' cape over my shoulders. The cape is put down for a nap with my son as I quickly don my 'writer' outfit from noon to three. When three rolls around, I wake my 'mommy' cape up along with my son and wear it until seven when my husband and I put him to bed for the night. After little man is in bed, I write until I get too tired to look at my computer anymore. When I told my agent, Pauline, how often I write, I think she was a little shocked. I really, really enjoy losing myself in a character's life. I'm a creative person by nature and, to me, writing is just as wonderful, probably more so, than actually reading because I can do whatever I want with the storyline. With the Tabitha Hale Saga, it hasn't been based on just one dream, but several that I have laced together. Call it divine inspiration or heartburn gone wonky, either way, I am writing the story how I feel it was meant to be written. How much time do you have? The list of things I like to do/want to learn seems to be growing with each passing day. As most of you already know, I'm a huge reader and try to fit in anywhere from a book a day to three books a week depending on what kind of time I have available. When my husband is home and I'm thoroughly annoyed with my writer's block, I play XBox 360 with him to unwind. I will spare you the list of games I enjoy. I love, love, love savoring memories with my camera. Movies. Oh man. Don't get me started on this one or we'll be here all day! I'll just say I recently watched the new Spiderman and Batman movies and leave it at that. My grandmother. She was an author and self-published several books before she died. I always admired her and thought it was the coolest thing that she had written a book. In the beginning, I wrote because it was an escape from things I was going through when I was younger. If you would have told me that I would have been an aspiring author in four years time, I would have told you you were insane. I hated English class at one point, allowing poor teachers to dampen my enthusiasm, but I have always been good at making things up. Thankfully, my family is very supportive of my writing. They have listened to me talk animatedly about my characters for some time now, bless them. In contrast, I have several friends who are writers that have no support system. I couldn't imagine not having any support, but for those who do not and keep pushing on anyways... they get two thumbs up and an oreo cookie! I occasionally struggle with time management and have not fully figured out how to fit everything and everyone into a single day, but I am getting better at it. Alas, it is a part of the learning process. It really depends. A Perception of Dreams began in December of 2008 and was not finished until 2012. At that time, I had been writing occasionally with no plans for any sort of serious book to result from it. In comparison, I finished book three in five and a half months. Granted, it is not edited yet and I have a couple things to add still, but the majority of it is finished. The main difference between the two was the fact that I was really absorbed in the story and knew where I was going by the end of book two and the beginning of book three. I was privileged to take part in my first interview with Jacco a couple days ago. After talking for a bit, Jacco was able to get a portion of A Perception of Dreams out of me. Check out the sneak peek in our conversation here: interview. I know this doesn't really pertain to your book, but I noticed the cute dog in the picture on your website. What's his name? 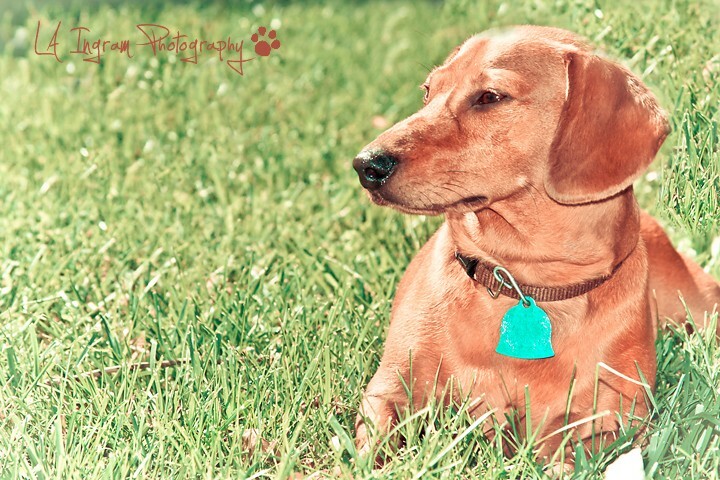 His name is Peanut and he is a miniature dachshund =) He sits with me on the couch every time I write. I love him to pieces! What is your ultimate goal with the Tabitha Hale Saga as a whole? Ahh, trying to weasel the ending out of me, eh? As of right now, I have a pretty good idea of where and how I would like to end it, but that is just tentative. I know without a doubt where I am going with some characters, but still have to figure out a few. I turn on my music, snap on my headphones, and just see where my imagination leads me. To answer your question: in the end, the battle will be between good and evil, though there will be casualties as with any good story. Which of your characters has been your favorite to develop? Tabitha. In many ways she is essentially me. She is strong willed, determined, and holds nothing back. But she is also the person I wish I were. She learns that she needs an 'inner filter' and can't always say everything she thinks out loud, which is something I still struggle with. David Eddings has been and always will be my favorite author. His books are the epitome of what I believe a fantasy book should be. It's not a fantasy book without a map, I say, and he has plenty of maps! There are many other authors who have written books I enjoy. If you take a peek at Goodreads you can check out the ones I have read as well as the rating I have given them. I'm always on the lookout for another good book. Feel free to send me suggestions of any novels you enjoy! It's the middle of the week, folks, which means there are only two days until the weekend begins! Does anyone have anything exciting planned? I am getting together with a fellow author on Friday morning to write and am looking forward to it. Also, I am taking part in an interview this weekend about the Tabitha Hale Saga so be sure to watch for more news on here, Facebook, or twitter! I love this question, although the answer is pretty silly when I think about it. After my husband and I put our son down for the night, we both kind of retreat to our own little 'zones' of the house. He plays Battlefield on his Xbox 360. I get my computer, turn off the internet, open up Pandora, pop on the headphones to tune out the world (and my husband's game), then write to loud dub step. With the music in my head, there's no room for thinking about miscellaneous things. I can solely focus on whatever decides to come out of my head, travel through my fingertips, and land upon my keyboard. Are there things that you refuse to write about? What are they and why? Yes. The biggest thing I refuse to write about is the in-depth sexual scenes that Hollywood is so fond of portraying. I don't care if you're a young or old adult. I believe in modesty. I can give you the general idea of what my characters are doing or thinking without putting images into your mind that will stay with you or your children forever. To me, there is so much more beauty and mystery in implied sexual tension than there is in the description of the act itself. After a hectic weekend, I'm thinking it's about time to plunge myself into a new series. Even writers need brain breaks every now and then ;) Any suggestions on what I should start? What has been the most fun part of being a writer? Having absolute control over what comes out of my head and gets put onto the paper. At the end of the day, it's my book and my imagination that conjures up the words. Just the other day, while working on the fourth book, I put something in and kind of looked at it like, 'I can't do that, it's never been done like that before.' The more I thought about it, the more I realized that the decision was ultimately mine to make. As Walt Disney once said, "It's kind of fun to do the impossible. "We've now reached the end of our power trip. Please return your trays to their upright position. I hope everyone had a good weekend. After a long day, I'm finally sitting down to answer today's question. What is the most important thing you have learned about writing thus far? Oh, goodness. That whatever my mood is most typically gets portrayed into the character's mood! I don't know how many times I have gone back to read what I've written only to remember exactly what took place to put that scene into my mind; usually because something had happened during the day to put me into that mood. Ah, Saturday, you are a welcome sight. The weekend is when I get the most writing done because my husband is home to watch our son, but I have to admit that the idea of a nap keeps lingering in my mind. My goal tonight is to finish the eighth chapter in book four. Hopefully some of you read the previous post about how important it is to not only set goals for yourself, but also to have someone else keep you accountable to complete said goal. For those of you who are writers and are reading this, make sure you set aside some time today to get at least a paragraph of something written! At the very least, it will help you unwind after a long day. What are you the most afraid of? Does this inspire any part of your writing? Probably the reality of life is what I am most afraid of, and it plays its role heavily in my writing. In my daily life, I always try to go through it remembering that this could be the last day I ever see someone. Having gone through a traumatic car accident when I was younger, I realize how quickly life can change and really try to hit that hard in the Tabitha Hale Saga. Never take your life for granted, because it could be the last day you have to spend with the people you love. How do you stay motivated as a writer and what keeps you going? I sat for quite a while and thought of how best to answer this question. I wanted to make sure that I not only answered the question, but also encouraged other writers who may be struggling with motivation as well. The idea for this book came from a dream which I had in December of 2008. Since that dream, I have written nearly every day since. I don't write because I want to be 'famous' some day. I don't write because I want some sort of gratification or recognition from others. I write for myself. At the end of the day, it's just me and my thoughts. In the beginning, I wrote because it was an escape from things I was going through when I was younger. If you would have told me that I would have been an aspiring author in four years time, I would have told you you were insane. I hated English class because I allowed bad teachers to ruin it for me, but I have always been good at making things up. While writing still helps me unwind after a hard day, it's become more about how much I want others to see the images that I see in my mind. I can't tell you how excited I am that the Tabitha Hale Saga is finally in the publishing process- because I want everyone to know the characters and love them as much as I do. That's what keeps me going. How I stay motivated is another beast in and of itself. I set goals for myself daily. For example, today I woke up knowing I had a coffee date with a friend. I also have a youth group activity to attend this evening which leaves the in between 'free'. I typically write at the end of the day before I go to bed, but with the activity tonight, my goal was to get my daily post written and then get a bit of book four accomplished before I have to turn around and leave again. It really is all about time management. Set a reminder on your phone that sends you an encouraging quote or pencil in a specific time without the internet that you have to sit down and write. Let a friend know your schedule so that they can help keep you accountable in your time management and don't let anyone bring you down. The moment you allow negative thoughts to crowd your mind, you have lost the ability to write. Instead approach negativity with the outlook of, 'I will prove all of them wrong.' And don't just say it. Do it. Goodness, today has been a long day. I feel as if I have been scrambling in five different directions to get where I need to be on time. *hugs computer happily* It's so nice to be sitting down for more than five minutes! I put a great deal of thought into each character before I named them and spent quite a bit of time pondering that name's meaning as I applied it to their personality. In Hebrew, Tabitha means: Beauty, grace. It is taken from the Aramaic word for Gazelle. It is also biblical. In Acts 9:36 she was noted for good works and that is, essentially, Tabitha's personality. She is the type of person who will always tell you the truth, no matter how much that truth may hurt to hear. She stands up for what is right, and speaks when no one else has the courage to do so. As the lead character, she is strong, but is also struggling to find the meaning in her life now that her parents are no longer around to guide her. As for Emma, her name is German in origin and means whole, complete, and universal. Without revealing too much, this defines her character. Emma is somewhat shy as we first meet her. Her mother has insisted she grow up with frilly, 'girly' things. She is modest, and wouldn't dare speak her mind ... at least, not around those she does not know. She has always wanted to be more daring and outgoing though ... like Tabitha. If you have a question for me about the Tabitha Hale Saga, please feel free to shoot me a message here or leave a comment at the bottom of this post and I will incorporate it into my daily schedule. (Once you're on the website, click 'contact' on the upper right hand side.) Make sure you subscribe either via email or blog so you don't miss tomorrow's question! If you're just now taking a peek around and want to know more about the THS (Tabitha Hale Saga), feel free to go here for a short description of who I am, the synopsis of the first book (A Perception of Dreams), as well as the entire first chapter. With the main character being a female in her teens, it seemed natural to steer the book towards a teen/young adult audience. I wanted to actively pursue the trials she faced as a young woman growing into adulthood. Many of the difficulties, though in another world, are similar to what any teenage girl would go through – heartbreak, wistful romance, the challenge to stand up for what's right, speaking out when most would stay silent, and overcoming the supreme obstacle of feeling like you're alone in the world. As Tabitha finds purpose in her life though, she also finds hope for the future. Don't want to miss the next question? Get all of my posts sent to your email on the right hand side. See you tomorrow!